Free Printable Flag Day Word Scramble. Free Printable Flag Day Word Scramble, a great Summer activity for your kids to have fun and learn at the same time. Unscramble all the Flag Day related words in this game at home, summer camp or summer school. The free Printable Flag Day Word Scramble includes a list of 20 scrambled United States Flag related words like Pride, June, Fifty, Flag, American, Stars, USA, Congress, Blue, Red, Stripes, Valor, Justice, and many more. You can find the answers list in page 2. Click the link below to download or print the Flag Day Word Scramble game now in PDF format. Free Printable Stranger Things Word Scramble. Free Printable Word Scramble the favorite TV Show from NETFLIX “Stranger Things”. Print Stranger Things word scramble game and share it with friends, 80s fans, family, co-workers and have fun unscrambling the words and characters from Stranger Things season episodes. Find words like VHS, BOB, Barbara, Waffles, Lucas, Mike, Will, Hawkins, Dr. Brenner, Jim Hopper, Demogorgon, Gate, Jonathan, Arcade, Bike, Joyce and many more. 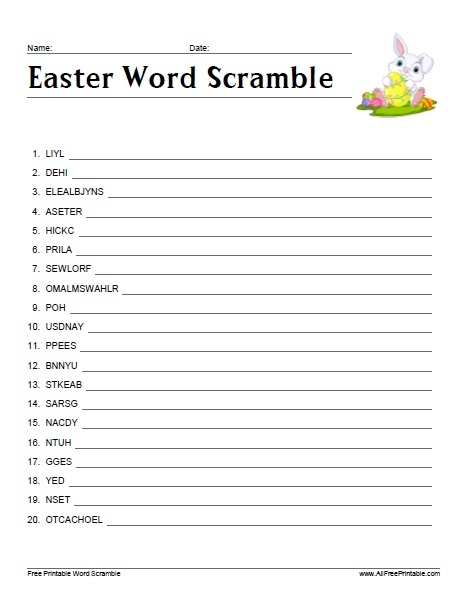 The word scramble includes the 24 scrambled words from all seasons and answers on page 2. Click the link below to download or print the Stranger Things Word Scramble now in PDF format. Free Printable Costa Rica Word Search Puzzle. Print the free Costa Rica word search and try to find Costa Rica’s top places to visit, typical food, birds, flowers and more. Great activity to have fun with your kids and learn more about Costa Rica. Share this word search with your friends or with your kids at home. If you are planning a vacation this activity can be a fun start to know where you want to go when traveling to Costa Rica. Find all the Costa Rica related words like San Jose, Central America, Alajuela, Monteverde, Cartago, Gallo pinto, Ceviche Tico, Cerro Chirripo, Corcovado National Park, Playa Samara, Marimba, Yigüirro, Santa Elena, Limón and more. The Word Search Game includes 24 words in PDF format. Find the solution on page 2. Free Printable Father’s Day Word Scramble. Free Printable Father’s Day Word Scramble, great activity to have fun at your Father’s Day celebration this month of June. Who will be the first to unscramble all the Father’s Day words in this game? The free Printable Father’s Day Word Scramble includes a list of 16 scrambled Father’s Day related words like June, Tools, Sunday, Sports, Hugs, Cars, Protective, Dad, Hugs, Funny, Gift, Work, Tie and many more. You can find the answers in page 2. Click the link below to download or print the Father’s Day Word Scramble game now in PDF format. Happy Father’s Day!